This is the 5th in a series of 8 articles on product finding that draw on findings from our recent homepage and category usability report and benchmark. When users get stuck during their product search, they will often stop and scan the page for anything that remotely resembles the type of product they are looking for. This is what caused the behavior described in our prior article on inspirational images and product links, and the behavior is at the root of this article as well. During usability test sessions, we time and again observed users who scan the page anything that could fit their needs, only to drawn in by the thumbnails of featured products. Yet upon inspection, the user concludes that that particular product isn’t relevant to them although the product category is – they are absolutely interested in the product type, just not the particular product(s) that happened to be featured that day. Users therefore need a way to access the product category and not just the featured products. If a user is looking for a doll they would likely spot the one in ‘Hot Sellers’ here at Toys’R’Us. 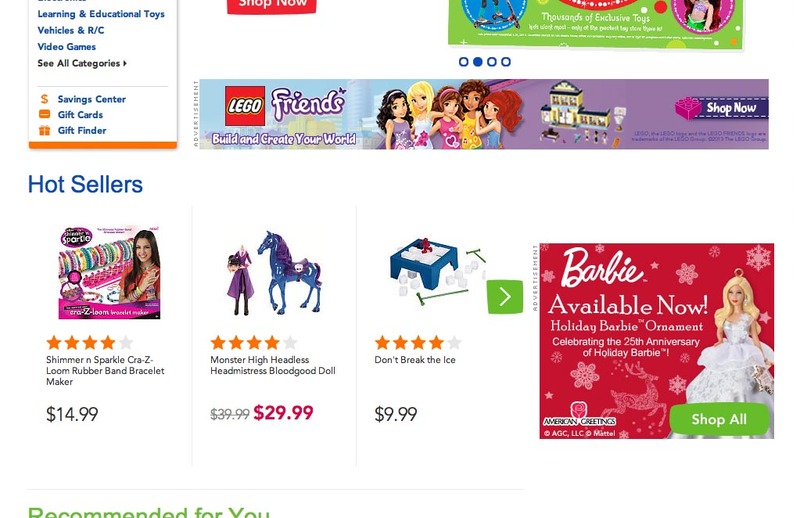 However, with no way to access the general ‘Dolls’ category from the featured products, the user can only choose a headless doll (which some parents may find a little unsettling to give to their kids). We have observed a few users get creative on e-commerce sites that were missing links to categories from featured products. For example, some users will actually open a product they aren’t interested in, in the hopes that hierarchy-based breadcrumbs will be available on its product page – allowing them to then traverse back up to the product category the item belongs to. Of course only a few users get this creative and it’s hardly ideal to force users to make such workarounds. This is why linking to not just the featured products themselves but also their categories is critical. It helps enhance cross-navigation throughout the site and allows users to jump directly to a relevant category after being drawn in by a specific product. Some users also just want to give their product search its due diligence, and make sure they’ve looked over the site offerings in the product category before committing to a particular item. Microsoft (left) sports a link to ‘Shop all laptops’, offering users a quick way to see other laptops in case these particular holiday deals don’t hit a home run with the user. CDW (right) links to the product categories of each featured product. How the actual category link(s) should be implemented depend on whether the featured products are sourced from one or multiple categories. If all of the featured products are sourced from the same category, then a general link next to the section header will suffice (see the left-hand Microsoft example above). If the products are sourced from just 2-3 categories, these could reasonably be listed along the section header too. However, if the featured products are sourced from numerous categories, this obviously won’t work. Another approach is to list the respective category for each featured product (see the right-hand CDW example above). This can quickly clutter the page with links so be careful in the implementation, but if there’s only a few featured products and they are displayed in a spacious environment, it can work well. 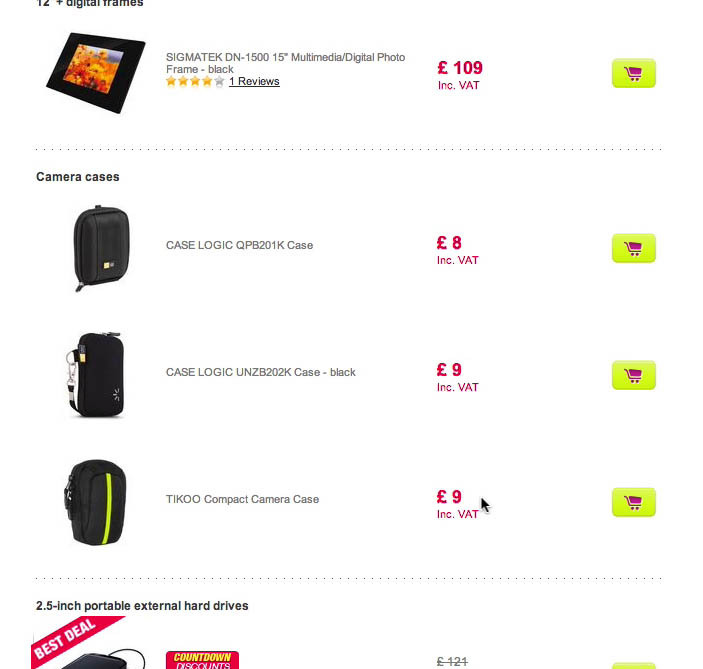 Here a subject from one of our test sessions thinks that Pixmania only offers these three ‘Camera cases’ – since he couldn’t find a link to ‘see all products in this category’ he assumed this was the whole category. Besides their navigational benefits, these links also serve as useful information scent to the user. It makes it easy to glean where a product belongs in the site hierarchy and makes it more transparent where the featured product(s) were sourced from. Perhaps even more importantly, these links help clarify to the user that they are only seeing a small selection of the site’s offerings in that product category. We’ve seen many test subjects falsely (though understandably) conclude that the site only carried the items listed in the featured section because the category wasn’t linked to. It’s particularly common for cross-sells to suffer from this misconception, especially in the cart if the suggestions are based on the cart contents. Yet despite all of this, our Homepage & Category benchmark revealed that 43% of the top e-commerce sites were missing links to categories from featured products. Given how easy a “fix” this is, there’s no excuse for not adding these links to enhance cross-navigation throughout your e-commerce site. It’s time to link up those featured products to their respective categories so users can benefit from these sections even when the featured products themselves aren’t perfect matches. Authored by Christian Holst. Published on January 21, 2014. Great! I already make many of the things you suggest in your articles, but this is not one of them. I can clearly see it’s usefulness and will try to implement it at work form now on. Thanks!